The weekend is over, the second and third looks at the film are in and the grades are ready for the Patriots 23-21 win over the Arizona Cardinals on Sunday Night Football. An unfortunate computer glitch prevented this from being posted on Monday afternoon where it will be for the rest of the season. So how did the Patriots grade out? Considering that the best QB and TE in the game were missing along with the team’s best RB, both starting tackles and their most clutch DE, it is a good day to be a Patriots fan considering how the game turned out. So let’s start with the offense and the players can come forward to pick up their grade sheets. Okay, so it was far from perfect but considering what Jimmy Garoppolo was dealing with, missing so many key components in the offense, and having two new members of the team playing in their first game in New England (Bennett, Hogan), and facing a 13-3, Final Four team on the road? Oh and he was starting his first NFL game. Jimmy G. (you can’t call him that! ), played with remarkable poise and coolness in the pocket. His looking off of the deep safety (Swearinger), on the Hogan TD was sweet, as well as his recognizing the coverage and changing the play at the line. The buying of time on the 3rd and 15 to Amendola was Brady-esque. He shoulder-faked the safety and slid in the pocket to his left and didn’t panic and throw too soon, which would have resulted in a pick. He threw a laser to Mitchell which turned into a 28-yard gain. Ditto for the 3-yard 3rd down conversion to James White. 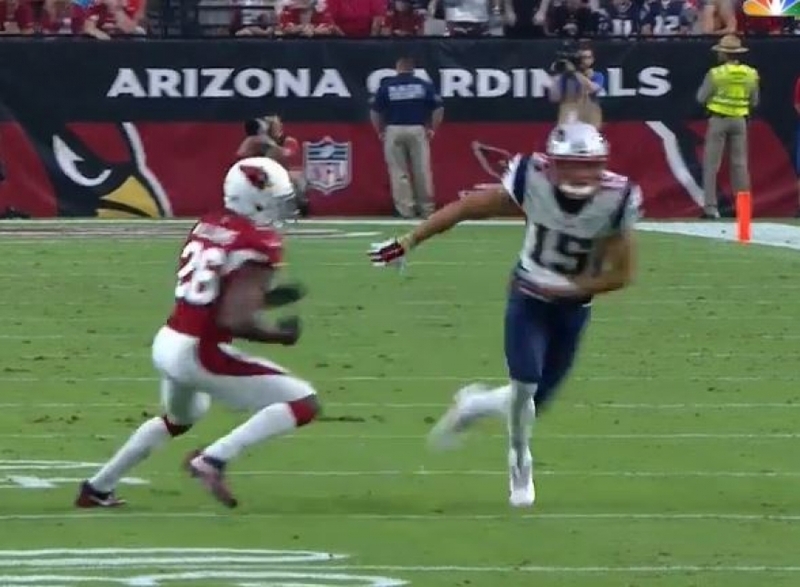 He needed to get his second half sideline throw to Julian Edelman out much faster. 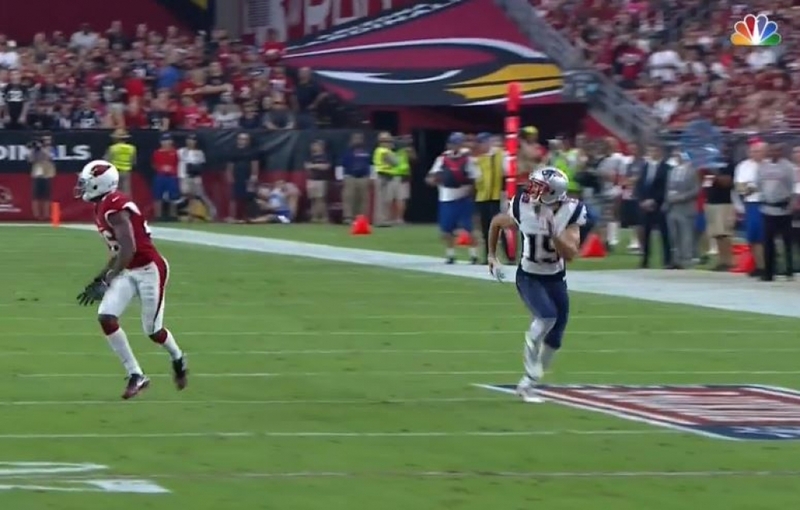 Edelman was about de-cleated by Patrick Peterson. Overall, it was a great performance, now….we’re on to Miami. LeGarrette Blount, who continues to get a ton of shade thrown on him, played pretty solidly. His touchdown run was classic. He got up a head of steam and carried half of the Arizona defense the final 3-4 yards into the end zone. He made a nice run on the 3rd and 11 on the Pats final drive, making Peterson miss and rumbling 13 yards for the first down. His average wasn’t great but he was the lead back for a team effort 106-yard night. If I told you the Pats would rush for 100+ yards last week, would you take it? James White did a good job in blitz pickups and made a couple of nice catches out of the backfield, scooping one almost on the turf and another shielding the defender using his body to get a tough first down. Brandon Bolden? Ugly exchange resulted in a fumble. Garoppolo got over his opening throw jitters by leaning on Julian Edelman who had three catches for 37 yards on the opening drive. He looked like his normal uncoverable self, underneath the coverage and any lingering doubts about his foot seemed at least for now, to be put to rest. Chris Hogan capped off the opening drive with a 37-yard TD catch. He shimmied rookie Brandon Williams out of his jock and had an easy touchdown. He looks like a happy camper being in New England and it showed on the field. He did whiff badly on a wham block that got Blount hammered six yards deep in the backfield. Malcolm Mitchell and Danny Amendola didn’t get a ton of targets but both turned in big plays with a 28-yard catch and run, burning the aforementioned Williams. 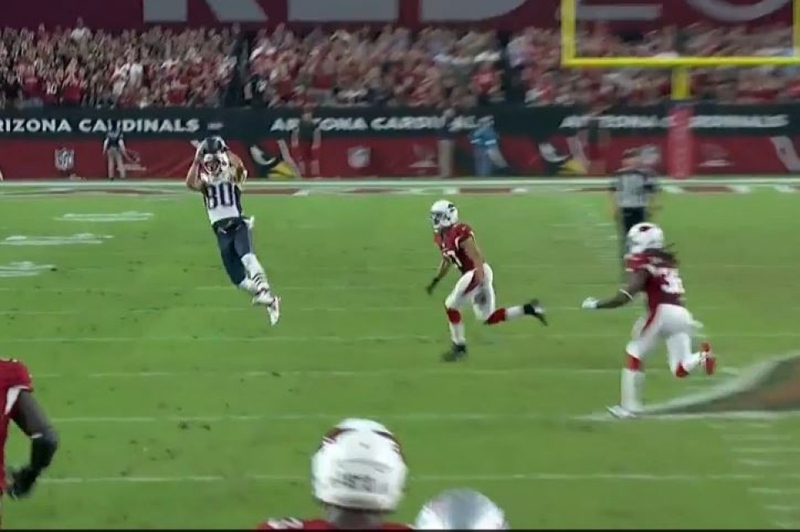 Amendola’s 32-yard catch on 3rd and 15 was money. Wasn’t an easy catch and he recognized the play breaking down and cut his route deeper finding the sweet spot in the zone. We didn’t have a Gronk sighting but did see a black Unicorn and was he impressive. Martellus Bennett was praised by both Bill Belichick and Josh McDaniels for his unselfish play. His blocking was like carrying an extra tight end out there and he man-handled Chandler Jones with ease on many running plays. A.J. Derby played only a handful of snaps and it wasn’t pretty…nuff said. Maybe this is a bit high of a grade, but considering who wasn’t playing, who was and who their opponent was, it was a much better scenario than was widely imagined, especially in the Arizona and national press outlets. Joe Thuney was very solid overall and held up well in pass protection. David Andrews had an up and down night, but his communication, key against facing a team that loves the A-gap blitz like Arizona was good. Cameron Fleming did okay for the most part facing Jones, which was supposed to be a mismatch. He frequently used the cut block to slow him down and keep him from getting his arms up. Alex Karras, Shaq Mason, and Marcus Cannon struggled for stretches. But overall the unit held their own against a very tough defense on the road. The Patriots edge rushers Chris Long and Jabaal Sheard were very solid if unspectacular. They did a great job of setting the edge and funneling the plays back to the inside. David Johnson had 16 carries for 89 yards but 45 of them came on one play where the tackling was poor everywhere. But for the rest of the evening, they held the dangerous RB for 15 carries for 44 yards, less than 3 yards per pop. Long had a sack, three QB pressures and drew a holding penalty. Sheard had four QB pressures. Alan Branch and Malcom Brown were solid inside, they also got some good rotation in with Vincent Valentine and Anthony Johnson seeing some significant snaps. The pass rush was okay but not great and netted three sacks. They’ll be better as the season moves along. This wasn’t the greatest of games for the Patriots dynamic duo of Dont’a Hightower and Jamie Collins. The game plan was a bit more passive than usual with the defense taking deep drops to keep the play in front of them, forcing the Cards to go the length of the field and preventing chunk plays. Hightower had just one tackle and seemed to be a non-factor for much of the game. Collins did have a sack and blew up a screen pass in the backfield, dropping Andre Ellington for a loss. But we’ve come to expect more. He also took a costly penalty, trying to block an extra point. Shea McClellin and Jonathan Freeny played sparingly and Barkevious Mingo played surprisingly only on Special Teams. It wasn’t always pretty, but overall they got the job done. They held the Cardinals who averaged 30 points and 300 yards a game thru the air, to just 21 and 252. Malcolm Butler was toasted early on a deep pass to Michael Floyd that he tried to sell to the refs that he stepped out of bounds on. Logan Ryan had good coverage on but was victimized by Larry Fitzgerald for two touchdowns because…he’s Larry Fitz. You couldn’t get much better coverage than he did on those. Justin Coleman had a nice pass breakup on a deep John Brown route. Rookie Cyrus Jones gave up a big 18-yarder on the final drive that could have allowed the winning field goal. Devin McCourty was outstanding and was everywhere they needed him to be. Pat Chung was solid in the box. Go to the head of the class Stephen Gostkowski. He not only made all five kicks, (3 FGs and 2 PATs) but his kickoffs consistently pinned the Cards deep in the end and forced them to go long distances to score. He was a major factor in this win and it had nothing to do with scoring. 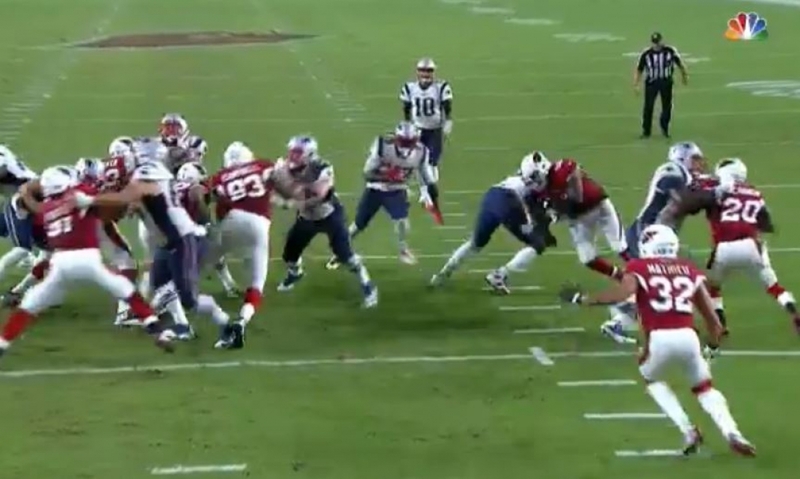 Ryan Allen had the hang time on his punts to give the dangerous Peterson little room to run. The coverage units were fantastic. Belichick is the gold standard and everyone else plays for second. It is ridiculous that he never gets any kudos for coach of the year. Fantastic game plan and getting the players ready to go in a hostile environment on Sunday night. Josh McDaniels and Matt Patricia both had excellent plans and they both saw them thru well. Was it perfect? No but it was damned good enough. Joe Judge’s charges had their best game in a year. 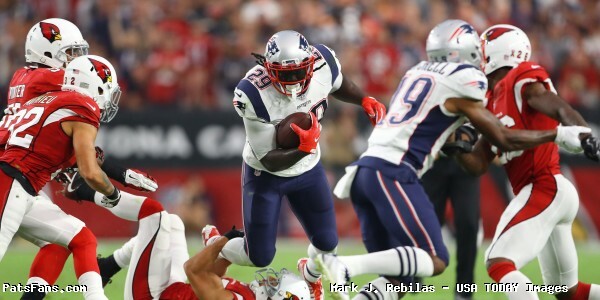 This entry was posted in Patriots Commentary, Patriots News and tagged 2016 NFL Season, 2016 Patriots season, Arizona Cardinals, Bill Belichick, Chandler Jones, Chris Hogan, Chris Long, Danny Amendola, Jabaal Sheard, Julian Edelman, LaGarrette Blount, Malcolm Butler, Malcolm Mitchell, New England Patriots, NFL, Patriots, Patriots edge rushers, Rob Gronkowski, Rob Ninkovich, Tom Brady on September 14, 2016 by Steve Balestrieri. Here’s a quick rundown of this morning’s top stories. Patriots Wearing All Blue Next Week – The team unveiled their “Color Rush” jerseys for this week and it looks like they’ll be wearing all blue when they take on the Texans next week. The uniforms were shown on Tuesday at the Pro Shop, with several players’ jerseys already available for sale. The jerseys are blue with red stripes on the shoulders, with the numbers outlined in red, with the words “We are all Patriots” embroidered on the collar. #Patriots in blue, Texans in white. The team will also be wearing blue pants, giving them their first all-blue look since the 2002 season when they wore them in a loss to the Broncos at Gillette Stadium. Hopefully, they have a little better luck this time around. Herd Envisioning Brady in Dallas – We’re just getting started with Jimmy Garoppolo’s run as a starter and if what took place Sunday night continues, the amount of chatter about his future is going to cascade over like a waterfall and create a likely situation where some will begin to wonder about whether or not it makes sense to stick with the younger player and move on from Brady. It will likely be much worse in the media and the whispers are already starting, with Colin Cowherd spending some time on Friday discussing the fact that he could see a desperate Dallas Cowboys franchise making a move to bring him to Dallas. 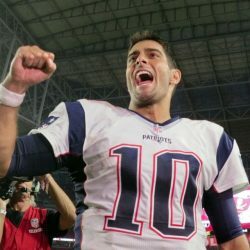 Cowherd believes two years is the max Brady has left and he believes the Patriots should consider moving him in the next 1-2 years and stick with Garoppolo if the Patriots are confident that the former Eastern Illinois standout can be “the guy”. Given Dallas’ issues, Cowherd believes it’s a “perfect” situation, giving him Dez Bryant for at least two years and an opportunity to get the Cowboys back to the Super Bowl. Bennett Earns Praise – Martellus Bennett wasn’t able to go out and have a big night after spending much of the game inside blocking at the line and keeping Chandler Jones away from Garoppolo. But on Tuesday Josh McDaniels talked about the veteran tight end, calling him “unselfish” after Bennett went out and did exactly what they needed as the Patriots won their first game of the season. Bennett finished with just 3 receptions on five targets, one of which came on third down. Overall he looked more comfortable than he did during the preseason and watching him manhandle Jones was great to see as he’ll be a player who will definitely be able to help out in that role this season. McDaniels was pleased with his performance and while he didn’t have a big night, McDaniels pointed out that what Bennett did went far beyond what showed up in the final totals. Gronkowski Could Be Out a Bit Longer – After sitting out week one, it looks like Rob Gronkowski might not be out on the field this week against the Dolphins either. According to ESPN’s Adam Schefter, the veteran tight end could actually miss the first few games of 2016 as he continues dealing with a nagging hamstring injury that kept him from making the trip to Arizona after he was downgraded to “Out” prior to the contest. Gronkowski suffered the injury during training camp and called himself “week to week” when he recently spoke to reporters, which raised a red flag after he said it and ended up being worth the concern when Gronk was unable to play on Sunday night. With the long-term goal being to have Gronkowski healthy for the postseason, having him sit out now is certainly more preferable if it means he’ll be good to go by the time January gets here. While it was great to see Garoppolo overcome injuries to lead the team to a win, it would definitely be a little easier if Gronkowski could be part of the mix as they get set to face what should be two tough opponents in Miami this week, as well as the Texans next week. But for now they still have to try and win with whoever is out there, and hopefully, we see Gronkowski back in action in the not-too-distant future. 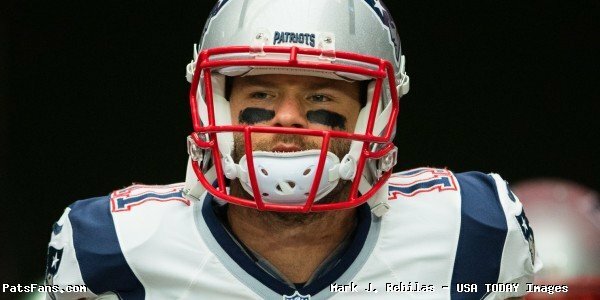 Patriots Bring In Players For a Workout, Release One – The team might have been off on Tuesday but the coaches were doing some due diligence on several players, with NESN.com reporting that the team worked out four players. According to the report, those players included wide receiver Anthony Dable, guard Ian Silberman, as well as defensive ends Davis Tull and Ryan Russell. They also released defensive back Mike Hilton from the practice squad. Dobson Works out with the 49ers – Oddly enough after being released by the Patriots during final cuts, wide receiver Aaron Dobson hasn’t found a new home yet. According to CSN Bay Area, the veteran receiver worked out for the 49ers on Tuesday, although no signing is believed to be imminent. Dobson has reportedly also worked out for Philadelphia and the Jets but the former second-round pick hasn’t landed anywhere at this point. This entry was posted in Patriots Commentary, Patriots News and tagged Arizona Cardinals, Bill Belichick, Chandler Jones, Color rush uniforms, Dallas Cowboys, Jimmy Garoppolo, Josh McDaniels, Martellus Bennett, New England Patriots, NFL, Patriots, Rob Gronkowski, Tom Brady on September 14, 2016 by Ian Logue. Reviewing the game film from the Patriots win over the Cardinals there was a number of interesting takes from seeing it a couple of more times on Monday. Patriots Were Targeting Williams: Early in the first quarter during their first drive on the Arizona 37-yard line, the Patriots lined up in a run formation with two RB, two TEs, and one WR (22 personnel). 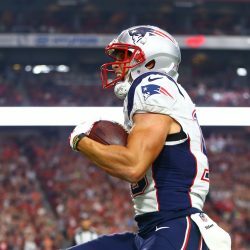 With the matchup of Chris Hogan on Cards rookie CB Brandon Williams, Patriots QB Jimmy Garoppolo changed the play at the line, tapping his helmet as a silent signal, something we saw in training camp and in the past with Tom Brady, they immediately changed the play to attack down the field. Hogan did a great job of beating the press at the line and single-high safety in the middle of the field easily beat the rookie down the field. Williams was also caught further by peeking back in the backfield allowing Hogan to run free down the sideline for an all-important first score. It was a superb example of the coaches and Garoppolo putting in the work in their preparation. Jimmy G. saw the 1-on-1 matchup and they went right after it. Later in the game during the 3rd quarter, they saw that matchup again and exploited it. The Cardinals coaches had to switch that up because they recognized immediately that the rookie wasn’t ready for the task yet. Facing a 3rd and 7, the Cardinals were showing pressure and at the pre-snap Garoppolo had rookie Malcolm Mitchell lined up opposite Williams with no safety help. Mitchell ran a quick out pattern, Williams went for the block and couldn’t get there. Mitchell gathered the pass in and was able to break the tackle and raced down the left sideline for a 28-yard catch and run that set up the next score. Bennett’s Role as a Blocker Was Key: Patriots tight end Martellus Bennett had a modest night catching the ball (3 catches, 14 yards), but stood out positively for his blocking ability. The “Unicorn” prides himself as being a complete tight end like Rob Gronkowski and the team held him in to block on about half of his snaps. Bennett frequently was tasked with blocking former Patriot Chandler Jones in the running game and frequently looked dominant in their matchups, pancaking the defensive end several times. On Blount’s touchdown, left tackle Cameron Fleming targeted the linebacker at the second level, Jones slid down to fill the gap and Bennett wham blocked Jones very effectively allowing Blount to get thru the line with a head of steam where he carried several members of the defense into the end zone. Another key play was the 3rd and 11 faced by the Patriots on their final scoring drive. Bennett was tasked with kicking the OLB (Golden) to the outside which he did with ease, allowing Blount to cut inside. D.J. Swearinger was sealed off by Joe Thuney who showed good athleticism getting to the second level. The resultant wash inside gave Blount all the space he needed. He broke a tackle by Patrick Peterson and easily made the key first down which allowed a much easier field goal and burned valuable time off the clock. Third Down Conversions: The Patriots made a number of key third down conversions going 10-16 on the day. James White and Garroppolo hooked up one where both the QB and RB displayed some excellent precision. Facing a 3rd and 3, White split out wide to the right. Cardinals DB Tony Jefferson was in coverage and shaded him to the inside. White was still able to quickly jump inside and used his body to effectively keep Jefferson off of him and the ball. Jimmy G. got the ball out quickly and right on the money for a key first down. Jefferson was visibly upset after the play for not being able to break it up. Garoppolo’s best play arguably was on the Patriots final drive. Facing a 3rd and 15 from the Patriots 19-yard line and behind for the first time in the game, he converted a huge field position flip. Garoppolo was looking to his right and his pump fake froze the safeties in the middle of the field. He then slid to his left and fired a pass deep downfield to Amendola who made a great catch, leaping up and hauling it in between three defenders for a gain of 32 yards. It was a superb display of moving the defense one way and just buying himself enough time to get the ball for the first down. Special Teams Were Special: Last week, Bill Belichick spoke about how STs, especially early in the season can make the difference between winning and losing. Sunday night was a prime example of this. While the botched snap at the end of the game obviously affected the Cardinals final FG try, the Pats units had a stellar game. Stephen Gostkowski hit on all five of his attempts, (2 PAT, 3 FG) but his kickoffs and the resultant coverage by the Patriots coverage units were stellar. With the new rules putting touchbacks at the 25-yard line, the Patriots, after the opening kickoff were intent on forcing the Cardinals to return their kicks. And they did a fantastic job, using the high mortar-type kickoff, they were able to pin the Cardinals deep all night and forcing them to go the length of the field, something that was clearly frustrating. They had stops at the 11-yard line and then via penalty the 8-yard line. Fantastic opening weekend for Joe Judge’s group. We should expect to see much more of this moving forward. Defensive Gameplan Worked: It quickly became obvious on Sunday that the Patriots plan defensively was to sit back in zone coverages and take away the big chunk plays down the field that was the hallmark of the Arizona offense in 2015. They would drop deep and make them throw it underneath and force them to work their way slowly down the field. It worked, they held the Cardinals, who averaged over 30 points a game a year ago, to just 21 and 14 of them were on short fields due to turnovers. This was clearly frustrating Carson Palmer at times as they were unable to throw the ball deep. It was a classic case of Bill Belichick taking away what an opponent does best and forcing them to beat you in a different way. The tackling in the secondary for the most part was really solid, somewhat surprising since the team doesn’t do a lot of that during training camp. One other note, Larry Fitzgerald continues to amaze. While other WRs are slowing down at his age (33), he still looks at the top of his game. He makes ridiculously hard catches seem routine even when covered well. 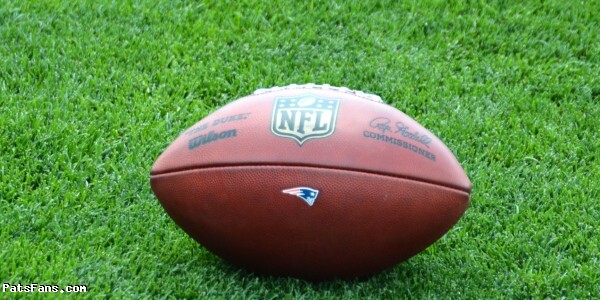 This entry was posted in Patriots Commentary, Patriots News and tagged 2016 NFL Season, 2016 Patriots Roster, 2016 Patriots season, Arizona Cardinals, Bill Belichick, Brandon Williams, Carson Palmer, Chandler Jones, Danny Amendola, Jimmy Garoppolo, Julian Edelman, LaGarrette Blount, Malcolm Butler, New England Patriots, NFL, Patriots, Patriots edge rushers, Rob Gronkowski, Rob Ninkovich, Tom Brady on September 13, 2016 by Steve Balestrieri. Coming into Week 1 of the 2016 regular season, fans of the New England Patriots had mixed emotions going into their team’s prime time opener against another perennial Super Bowl contender in the Arizona Cardinals. The team traveled without some of their best weapons and protection. Beginning at quarterback, Brady, out for the month on Deflategate suspension. Jimmy Garoppolo, unproven with zero career NFL starts was thrust under center in his place. Tight end Rob Gronkowski was out with hamstring issues that prevented him from flying to Arizona along with two starting linemen in Jonathan Cooper and Nate Solder also unable to go in front of Garoppolo. Lastly, defensive captain Rob Ninkovich, also out with an injury and also suspended. The result, a +9.5 point Las Vegas line that saw the Patriots have their largest underdog spread for the first time since Super Bowl XXXVI and fears of an embarrassment in the making out in the desert. While the team may have been confident, many fans and media were unsure of what to expect. 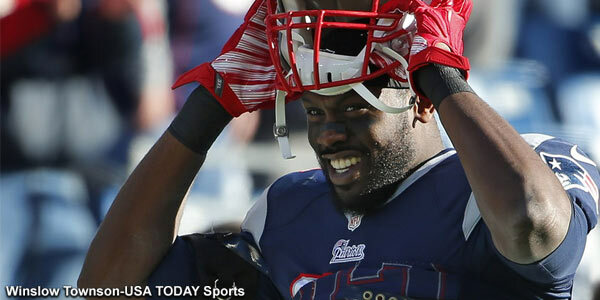 Former Patriot Chandler Jones met with owner Robert Kraft during pregame warmups. But before the game, both teams and fans took time to honor and remember the 15th anniversary of the 9/11 attacks. Wide receiver Danny Amendola, tight end Martellus Bennett and safety Devin McCourty were all spotted before the game providing unique tributes of Patriotism. Pops served 10 years as a Operation Specialist E5! Today's game is for you. Thanks for being the best dad ever, I love you! Let's get it!! The infamous Brady Banner was taken down as the first quarter was underway. Martellus Bennett with a little self promotion for his children’s book company. It didn’t take long for Garoppolo to find an early rhythm as he threw this precision pass to newcomer Chris Hogan for a Patriots early 7-0 lead. Edelman laid some guys out. Jimmy also completed a pass to himself. With all the thoughts of doom and gloom coming into the night, the Patriots found themselves leading 10-7 at halftime. 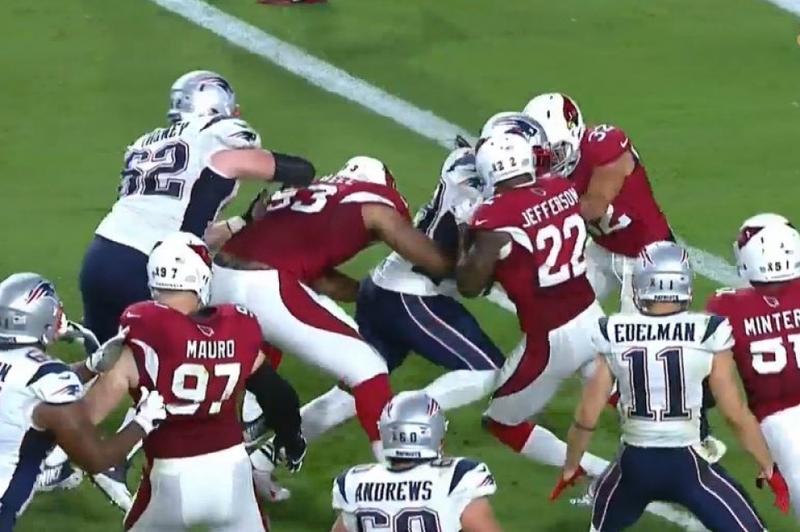 With the third quarter underway, the Patriots drove to a 10 point cushion with 10 minutes to go in the third by way of LeGarrette Blount taking half the Cardinals defense into the end zone with him. Turnovers killed the Patriots early, 14 Cardinals points off of fumbles and it was back to a three point game following a David Johnson score. 17-14 Patriots. 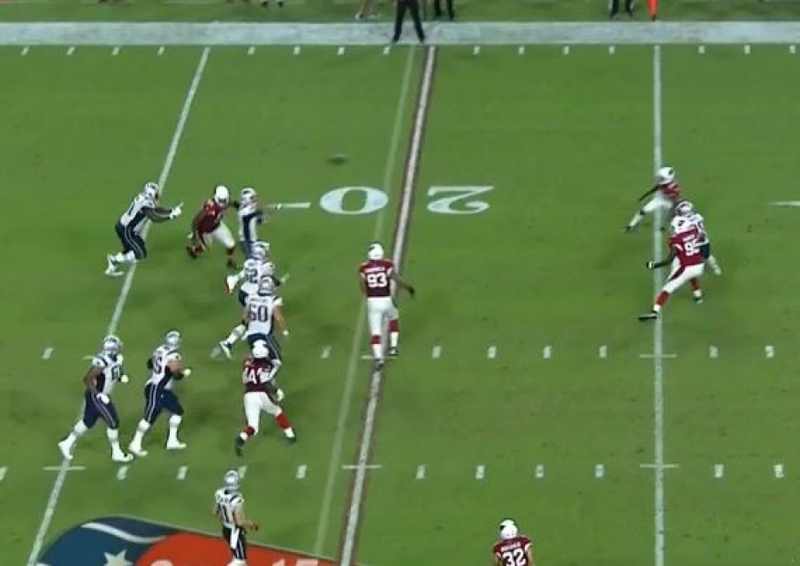 The Garoppolo led Patriots were hanging tough, but future Hall of Famer Larry Fitzgerald did all he could to keep his Cardinals in the game following this incredible 45 yard run by Johnson. Career touchdown reception number 100, Fitzgerald’s second of the game which gave the Cardinals the fourth quarter lead at 21-20. The kid out of Eastern Illinois didn’t back down, Garoppolo engineered a clutch drive of his own on the same stage Brady had just a few years earlier. Completing three third down plays, including a 3rd and 15 setting up a Stephen Gostkowski go ahead field goal with 3:44 to go in the game. 23-21 Patriots lead. So it was up to the Patriots defense to secure the victory. Despite a few deep passes from Carson Palmer, the Cardinals were forced to set up a game winning 47 yard field goal attempt from Chandler Catanzaro. Just like that, the upset was complete, New England Patriots 23, Arizona Cardinals 21. 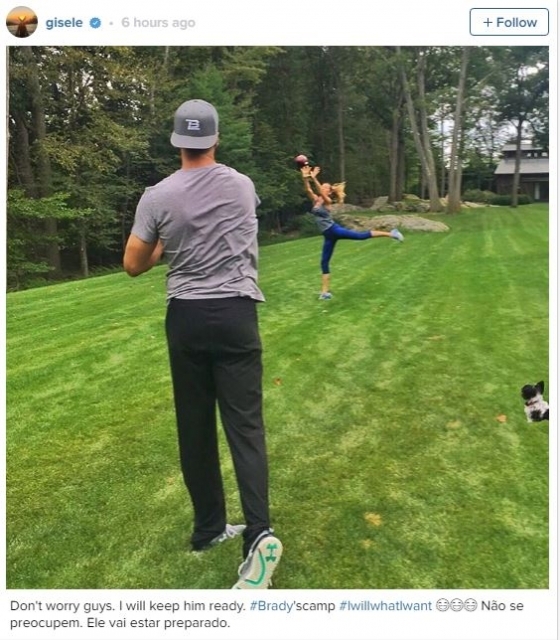 Take it away, Tom Brady’s Facebook page. No Brady. No Gronk. No Nink. No Solder. No Lewis. No Vollmer. No Cooper. Beats one of the best teams in the NFL in their place. Amazing. GLENDALE, Ariz.-One thing I think after interviewing/observing in Pats’ locker room: This win was utterly unsurprising to them. Long flights home are so much better when you WIN!! Great team win tonight! I love my team!! This entry was posted in Patriots Commentary, Patriots Photos, Patriots Video and tagged Bill Belichick, Chandler Catanzaro, Chandler Jones, Chris Hogan, Danny Amendola, David Johnson, Devin McCourty, Dont'a Hightower, Jimmy Garoppolo, Joe Cardona, Julian Edelman, Larry Fitzgerald, Martellus Bennett, Tom Brady on September 12, 2016 by Robert Alvarez. Look out AFC, this first month may just be a lot more of the same in terms of the Patriots winning ways. In a very impressive performance, Jimmy Garoppolo led the Patriots to come from behind game-winning drive in the final four minutes and the Pats hung on for a 23-21 win over the Arizona Cardinals. 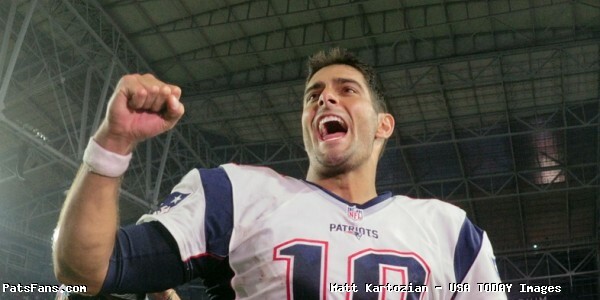 Garoppolo finished the night 24 of 33 for 264 yards and a touchdown. Most importantly, he didn’t throw any interceptions, although he did have a fumble that the Cards recovered after a strip sack. He showed the moment, under the glare of a national spotlight game wasn’t too big for him. This one was as improbable as the Super Bowl win over the Rams, it was also the last time the Patriots were underdogs (9.5 points in Vegas), that big entering the game. This wasn’t supposed to be this way. No Brady, no Gronk, no Ninkovich, no Dion Lewis and minus both offensive tackles, this wasn’t just supposed to be a loss, it was widely expected to be a blowout. They were facing an intact Cardinals team many are picking for the Super Bowl on the road in a wildly raucous stadium. Not only did Bill Belichick, Josh McDaniels, and Matt Patricia come up with a great game plan to steal a victory in the desert over Bruce Arians’ charges, but they’re also in a familiar position, alone at the top of the AFC East at 1-0. With Miami, Buffalo and the Jets all losing close games, the Patriots improbably, sit atop the division alone…again. After a lackluster preseason that saw him struggle without the benefit of game planning an opponent, Garoppolo played extremely well and showed a ton of poise in the pocket and made much better decisions and throws from the pocket. McDaniels came up with a masterful game plan and the coaches played to Jimmy G.’s strengths. They stuck with the running game that once again was largely stuck in neutral but ultimately paid off. The Cardinals couldn’t pin their ears back and attack the pocket with reckless abandon. Many times when they brought an extra pass rusher, the Patriots and Jimmy G. made them pay but finding and hitting the open man. Garroppolo admitted he was amped to start the game, his first throw was airmailed well over the head of Chris Hogan, but he quickly settled down and led the Patriots on an eight play, 74-yard drive culminated with Jimmy G. hitting a wide open Chris Hogan in stride for a 37-yard touchdown pass over rookie CB Brandon Williams to give the Pats a 7-0 lead. After stalling the Cardinals near midfield, the Patriots started their next drive at their own eight-yard line and Garoppolo led them on a 12-play, 63-yard drive that saw Stephen Gostkowski kick one of his three field goals on the night, a 47-yarder that put the Pats up with a 10-0 lead. Garoppolo shared a coolness under pressure that we’ve grown accustomed to with Brady, he didn’t rattle, nor make poor decisions but hung tough and was able to lead his team to victory. What better way to judge the offense than a look at third downs. The Patriots were an impressive 10-16 on third downs given the state of the Arizona defense and the very loud crowd noise inside the stadium. His most impressive drive of the night, the 13-play, 61-yard drive with just under ten minutes left in the game and with the team behind for the first time 21-20. With the crowd noise deafening, Jimmy G. led a game-winning drive that was pretty impressive. Facing a third and a very long, he found Danny Amendola for a huge 32-yard pass play that put them in business. Another third down completion to James White in a very tight window kept the chains moving. And finally, facing 3rd and 11, LeGarrette Blount rumbled for 13 yards setting the team up for a much more makeable field goal. Defensive Game Plan Worked: The plan by Patricia and Belichick was to keep everything in front of them, drop into zones and make the Cardinals earn their way down the field. And it worked, they held the high-flying offense to just 21 points. It wasn’t always perfect and it wasn’t always pretty but they largely kept the Cardinals from hitting those big chunk plays they are known for. Carson Palmer was held to 24-37 passes for 271 yards and two touchdowns on the night, far below his normal output which is about 300 yards a game. He was sacked three times for 19 yards. The Patriots largely kept RB David Johnson in check. He carried 16 times for 89 yards but more than half, 45 came on one run in the second half. He also caught 4 passes for 43 yards. Arizona averaged 30 points a game in 2015 and the Patriots held them to well below their average, in their home turf and dominated time of possession 33:59 to 26:01. Receivers Turn in Strong Debuts: Julian Edelman was his normal Energizer Bunny self on Sunday night, making the tough catches in tight quarters and moving the chains, especially early in the game when Jimmy G. was finding his way. 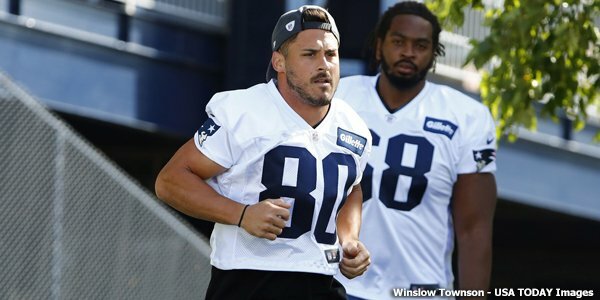 Danny Amendola is money. Making only three catches, his biggest the 32-yarder on a third and long was a beauty that kept the game-winning drive alive. A couple of the Patriots newcomers Chris Hogan and Martellus Bennett both had good first games as members of the Patriots. Hogan was a guy we picked as a player to watch in our pregame keys, and he delivered. He made three catches for 60 yards, none bigger than his touchdown to start things off. He’s going to be an intriguing guy to watch this season. Bennett only registered 3 catches for 14 yards but was asked to stay put and block for much of the night. And frequently his target was Chandler Jones. Bennett did a bang-up job on the Patriots former edge rusher, especially in the running game. As for Jones, he was his normal self, he did have a sack and a fumble recovery, but for much of the game, he was MIA. And on a night that many of the Arizona beat writers were calling for him to have multiple sacks against a backup tackle, it has to go down as a disappointment. Malcolm Mitchell played and chipped in with two catches for 33 yards, including a nice 28 yarder from Garoppolo. He’ll get more looks as he gets more comfortable in the offense. Offensive Line A Mixed Bag: The Patriots entered this game with two backup tackles, two rookie guards and a UDFA center. The matchup against what is supposed to be one of the top defenses in the NFC was said to be a mismatch in favor of the Cardinals. Like much of the other matchups, it wasn’t always pretty but the patchwork group of Dante Scarnecchia’s held up well. The run blocking was still far from what they want or need, but they showed a greater willingness to stick with it and it kept the Arizona defense honest. While their average per rush won’t set any records, the backs, especially Blount ran hard. The Patriots actually outgained Arizona on the ground, 106 to 92. The pass blocking was better than anyone could have hoped. 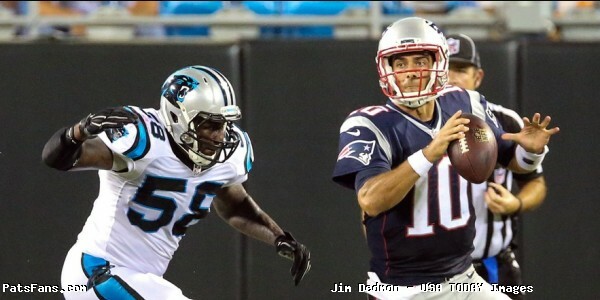 Again, it wasn’t perfect or always pretty but for the most part, they gave Jimmy G. the time he needed to make plays. Overall, considering who played, and who they were playing, they get passing marks. Special Teams Stepped Up: The Patriots pride themselves on their STs units and this group of Joe Judge’s had a very strong game. While we look at Gostkowski’s three field goals as the difference, his kickoffs were even more advantageous. With the new rules, touchbacks go to the 25-yard line, but Gostkowski put four of his five just around the goal line where the coverage units had fantastic coverage, forcing Palmer to start from deep in his own territory. Bill Belichick called this a big team win and it was as the Patriots went on the road in Week 1 and defeated a tough opponent in an even tougher environment. The win puts them in good position right off the bat in the division at 1-0. Jimmy G. looks like he belongs but this sends an ominous message to the rest of the AFC. It may be time to pump the brakes on the drop that everyone was expecting without Tom Brady for the first four games. And if New England can beat the Cardinals without Brady, Gronk, et al, how tough will they be once all of them are back? This entry was posted in Patriots Commentary, Patriots News and tagged 2016 NFL Season, 2016 Patriots Roster, 2016 Patriots season, Arizona Cardinals, Bill Belichick, Bruce Arians, Carson Palmer, Chandler Jones, Danny Amendola, David Johnson, Dont'a Hightower, Jabaal Sheard, Jimmy Garoppolo, Julian Edelman, LaGarrette Blount, Larry Fitzgerald, Malcolm Butler, New England Patriots, NFL, Patriots, Rob Gronkowski, Rob Ninkovich, Tom Brady on September 12, 2016 by Steve Balestrieri. Good morning, here are Sunday’s Patriots news 9-11, and AFC East Notes for this week. The NFL announced that they will honor victims, first responders, and military personnel on the 15th anniversary of that horrible day in 2001. Not often on these pages where you find us applauding the crew on Park Avenue but in this case, they’re spot on. Most of us can remember exactly where we were at when the four planes crashed in NYC, Washington D.C., and Pennsylvania. We put our petty differences aside and united as one people. One of the compelling images on that awful day was watching survivors leaving Ground Zero covered with soot, one couldn’t tell if they were black, white, yellow or red. They were all gray. But most importantly they were us, they were Americans. That’s why I think this entire protest thing going on with the NFL is wrong, especially today of all days. Colin Kaepernick has every right to protest social injustice in this country. That’s what every veteran who’s ever put on a uniform defended. It isn’t up to me to tell him he can’t feel this way, I’m not black so I can’t relate to his feelings there. Brandon Marshall joined in with his own “look at me” minute, and now we are told the Seahawks as a team will not stand during today’s game. Standing during the national anthem isn’t just about honoring the flag. It is about honoring us as a nation, as a whole. Are we perfect? No, and our nation will never be that. The USA is a microcosm of its people. There will be racists, criminals and ne’er do wells in all shapes and sizes. But what made this country great was it was a beacon of hope. We don‘t judge a man’s worth on who his father was, but on what he can become on his own. Everyone here has equal worth and the NFL is living proof of that. Men of color have fought, bled and died for that flag which represents us. The first black man in the US military was a citizen of my hometown of Millbury, Mass. Peter Williard. He fought as a militiaman at Lexington and Concord and later enlisted in the Continental Army. The Buffalo Soldiers of the 9th and 10th Cavalry during the Old West and the Tuskeegee Airmen, the Red Tails of the 332nd Fighter Group. If Kaepernick and the Seahawks want to stand for something, honor them. On this of all days is a time to stand together, not apart. Writing up our pregame keys and our players to watch is often an exercise in speculation. Without being in the room with Bill Belichick and the coaching staff, it is especially difficult trying to judge who will play and sit. This week was one of those times. We try to read the tea leaves and predict as accurately as possible how things will play out. We followed the old Patriots maxim of “if they speak to the media, they’ll probably play” in the case of Rob Gronkowski and whiffed badly on both pieces. We thought that Gronk, practicing every day would be ready to go and be a big part of the game plan (on both sidelines) for tonight’s contest. And were way off…which many of you have been very nice (and quick!) to point out in emails and DMs on social media. So the only thing we can say is…we’ll take the kudos when we’re right and the slings and arrows when we’re wrong. We’re like Avis…we’ll just try harder. 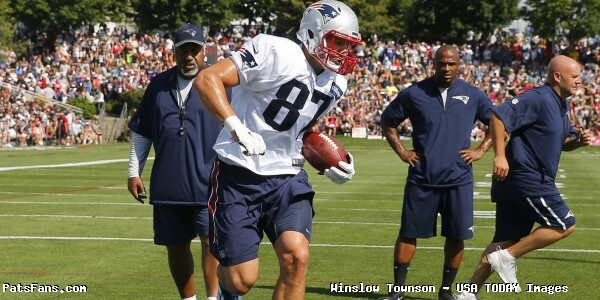 With Gronkowski Out, Do the Patriots Use 2-TE sets? So moving along with Gronk angle, without the big man in the lineup will the team use a lot of 2-TE sets or will they bring in the extra WR for the offense? And if they do use the extra tight end who will get the reps opposite Martellus Bennett? A.J. Derby was more impressive during the summer and appears to be the better blocker inside. He also showed some nice hands in the passing game as he was finding some open real estate and moving the chains. Clay Harbor is more of a move tight end but he was playing catch up all summer after beginning training camp on PUP. Bill Belichick usually favors the veterans in these type scenarios. They have the experience to fall back on. While both should see some reps, they’ll be testing the waters to see who will give them a better chance at winning the matchup battles. When the Patriots made the trade with the Cardinals this offseason, they moved DE Chandler Jones for G Jonathan Cooper and a 2nd-round NFL Draft pick. The Patriots flipped that pick into a 3rd (Joe Thuney) and a 4th (Malcolm Mitchell) so…on paper everything looks rosy from a Patriots perspective. But what do we really know about Cooper yet; After struggling with injuries in Arizona, he was brought in here with a clean slate. At first, in the spring and in the first few days of training camp, he was getting all of the first-team reps at right guard. Working with the legendary OL coach Dante Scarnecchia, things were looking up. But in the first padded practice, he went down with an injury. It was later learned the former 1st-round draft pick suffers from a plantar fascia issue. He’s been limited since July 30 and questions remain, what do we really know about his play at this point? He made the 53-man roster but in reality, he had about half of one practice against his teammates. For now, he’s full of more questions than answers. The Bills announced that backup tackle Seantrel Henderson will start serving his four-game suspension this week for testing positive for marijuana. Earlier Henderson had said that he’d appeal the suspension. But he changed his mind after meeting with the team. Henderson suffers from Crohn’s Disease and he had said that he used marijuana to take the edge off of the debilitating pain that he suffers from. He’ll be eligible to return Week 5 or October 3rd. In his absence, coach Rex Ryan stated that T Cyrus Kouandjio will take over the swing tackle duties behind starters Cordy Glenn and Jordan Mills. Miami now has a RB controversy. After spending a 5th round pick for Ajayi in the 2015 NFL Draft, he entered the 2016 offseason as the team’s top tailback. But the team drafted Kenyan Drake and Damien Williams this year and signed Arian Foster via free agency this summer. Rumors were circulating that Ajayi, who was demoted after Foster rose up the depth charts, was pouting and may have left the team for a short time. The truth to those are still under investigation but one thing’s for certain. The Dolphins under new coach Adam Gase won’t tolerate that and Ajayi is being left off the active game day roster for a reason. This will bear watching if the team decides that Ajayi may or may not have a future in Miami. The Jets finished last season with a 10-win season and narrowly missed the playoffs. But they (finally) brought back QB Ryan Fitzpatrick and added RB Matt Forte to a team that was already deep in offense weapons to go along with a very stout defense. Now they open the first six weeks of the season facing five teams that made the playoffs a year ago. First up are the Cincinnati Bengals at the Meadowlands followed by a primetime game in Buffalo, a team coached by the Jets former boss. Then Gang Green heads out to Arrowhead to play the Chiefs. The Jets return home to face the Seattle Seahawks then go back on the road to face the Pittsburgh Steelers and the Arizona Cardinals. That’s among the toughest schedules by far for the first six weeks and will either have the team in a prime position to contend or far back in the standings. This entry was posted in Patriots Commentary, Patriots News and tagged 2016 NFL Season, 2016 Patriots season, Bill Belichick, Buffalo Bills, Chandler Jones, Danny Amendola, Dion Lewis, Dont'a Hightower, Jabaal Sheard, Jimmy Garoppolo, Julian Edelman, LaGarrette Blount, Malcolm Butler, Miami Dolphins, New England Patriots, New York Jets, NFL, Patriots, Rob Gronkowski, Tom Brady, Trey Flowers on September 11, 2016 by Steve Balestrieri. 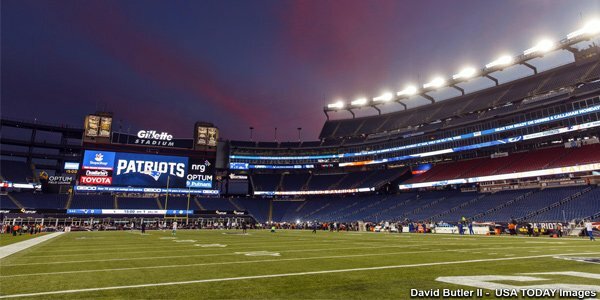 The Patriots will open the 2016 NFL season on the road in Phoenix against the Cardinals on Sunday Night Football. The team traveled a day early on Friday and are putting their final prep for the contest on Saturday. So with the wait before the game on Sunday night, here are some interesting numbers to pore over. 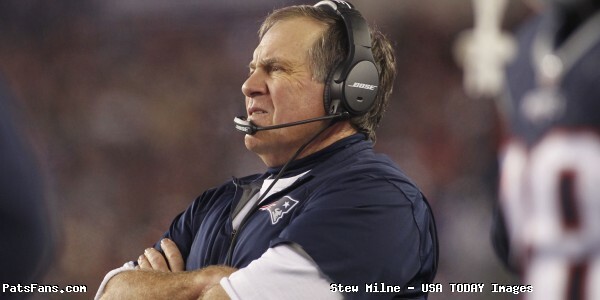 23: Post-season wins by Bill Belichick, most in NFL history. Landry (20) is second. 38: Number of playoff games played by the Patriots since Robert Kraft bought the team. Most in the NFL, Green Bay is second with 33. 38: Wins by the Pats since 2001 in games decided by 3 points or fewer. Top winning percentage in the NFL with .717 (38-15) during that time. 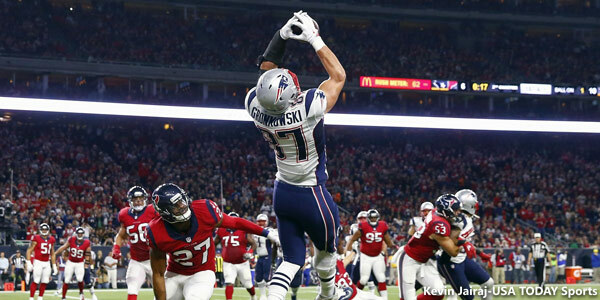 66: Career touchdowns by Rob Gronkowski, needs three to pass Stanley Morgan (68) for most in Patriots history. 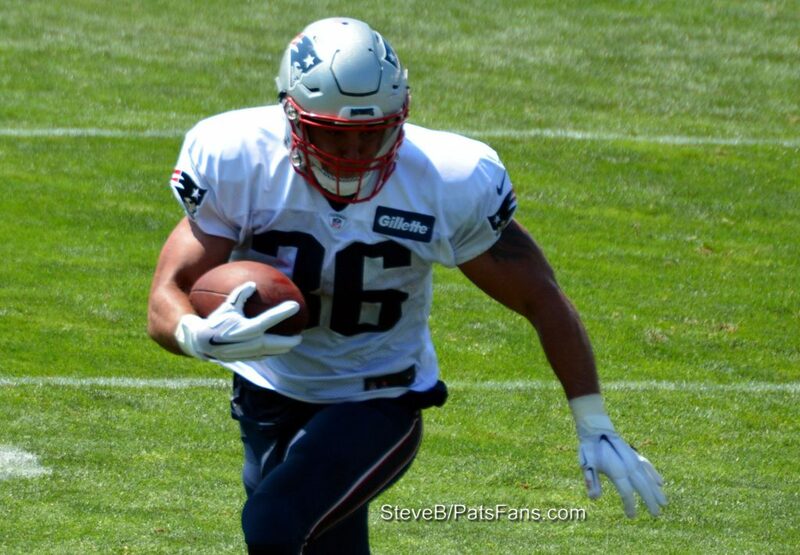 This entry was posted in Patriots Commentary, Patriots News and tagged 2016 NFL Season, 2016 Patriots season, Arizona Cardinals, Bill Belichick, Brett Favre, Chandler Jones, Drew Brees, fun facts, Julian Edelman, New England Patriots, Patriots, Patriots edge rushers, Patriots Training Camp Photos, Peyton Manning, Randy Moss, Rob Gronkowski, Robert Kraft, Steve Grogan, Tom Brady, Tony Collins on September 10, 2016 by Steve Balestrieri. It’s not often you see a player who was traded have to face his former team to open the season, but former defensive end Chandler Jones finds himself in that situation this week as the Cardinals continue getting ready for the Patriots. Having been traded to his new team back in March, Jones has settled in quite well in Arizona, with head coach Bruce Arians already pleased with how well he’s fit into the defense. Jones was never much of a run-stopper here in New England and it sounds like the Cardinals are aware of that and are trying to play to his strengths, which has been moving him out as an edge rusher. Jones had a relatively productive preseason with Arizona, finishing with a sack and two tackles for a loss in his time on the field. He played in 6 snaps in their Week 1 match-up against the Raiders, 12 snaps in Week 2 and 17 in Week 3. He dressed but didn’t play in their finale against the Broncos. One thing he does add is the fact he’s a player who, unlike the rest of his teammates, has some familiarity playing against Garoppolo thanks to having gone against him in practice during his time in New England. While Garoppolo hasn’t had any NFL game experience, Jones has seen enough to know that this week’s home opener won’t be easy, and he’s expecting a tough battle when they meet Sunday night. This entry was posted in Patriots Commentary and tagged Bruce Arians, Chandler Jones, Jimmy Garoppolo on September 8, 2016 by Ian Logue.